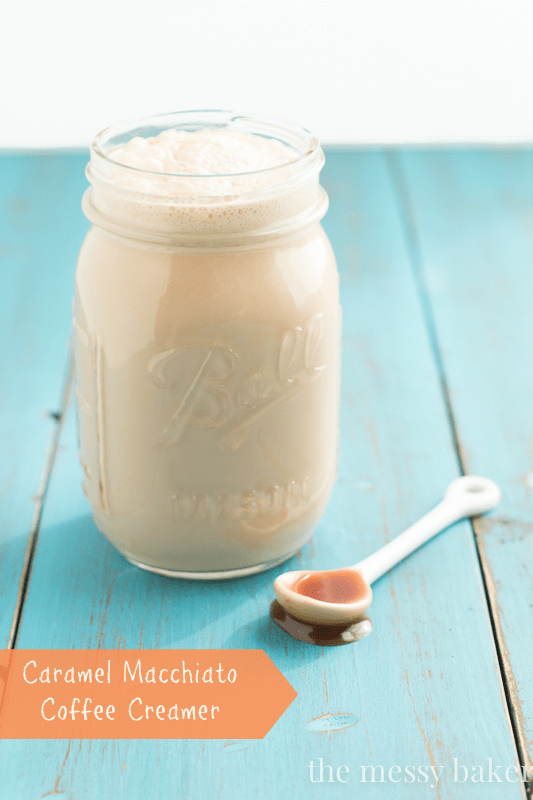 Homemade caramel and almond extract get swirled together to create a rich coffee creamer that comes together in minutes. I decided to take on a little kitchen challenge: homemade coffee creamer. I figured if store-bought coffee creamer is good, then homemade has to be better. My favorite coffee shop creation is the caramel macchiato. Rich, dark caramel floating atop strong coffee. I can’t get enough. At five bucks a pop, I’m afraid that’s a bit too rich for my blood. So, I did the next best thing, I brought the coffee shop to me. Making homemade creamer is unbelievably easy. 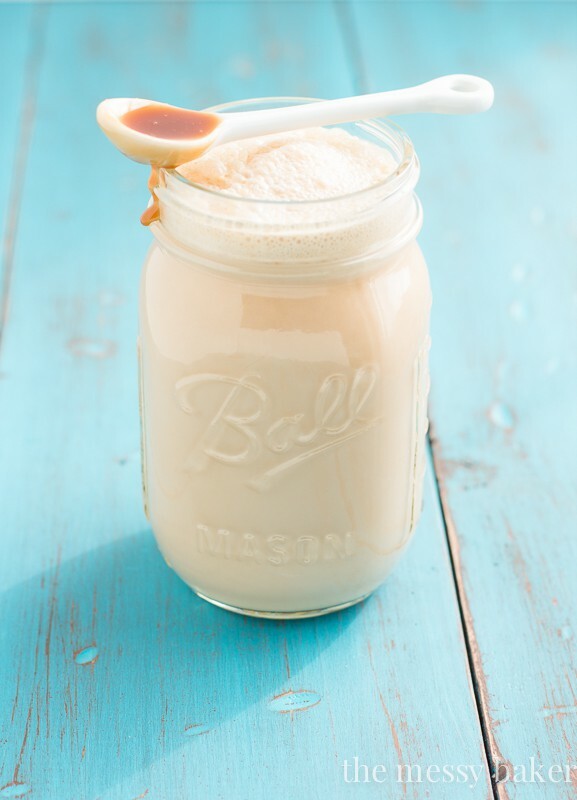 All you’ll need is milk, half and half, caramel (homemade or store-bought), and almond extract. Mix all of the ingredients together in a large measuring cup and, viola, you have homemade coffee creamer. The combination of milk and half and half creates a thick, silky base for the creamer. I used a generous amount of homemade caramel, because we can’t have a caramel macchiato without gobs of sweet, buttery caramel. A touch of almond extract is added to create that signature macchiato flavor that I love so much. I tend to go a bit overboard and drown my coffee with this rich creamer. You can swirl as much or as little as you like in your morning coffee. It’s delicious in both hot and iced coffee. Now your coffee can be special every day. Add all of the ingredients to a large measuring cup and whisk until combined. Store in a mason in the refrigerator for up to 7 days. Shake before swirling a few teaspoons into your favorite coffee or tea. This sounds way better than the plain old light cream I’m using in my coffee this morning. It sure is. I love the sweet, buttery flavor that this adds to my morning coffee, soon to be iced coffee. Come on spring! No weird ingredients. Just pure caramel flavor mixed with real milk and cream. Thanks for pinning! My coffee needs this creamer! Love the bit of almond extract! And I’d be okay with you doing that, because I did that. It’s so good! Thanks, Kim! What a great idea!!! 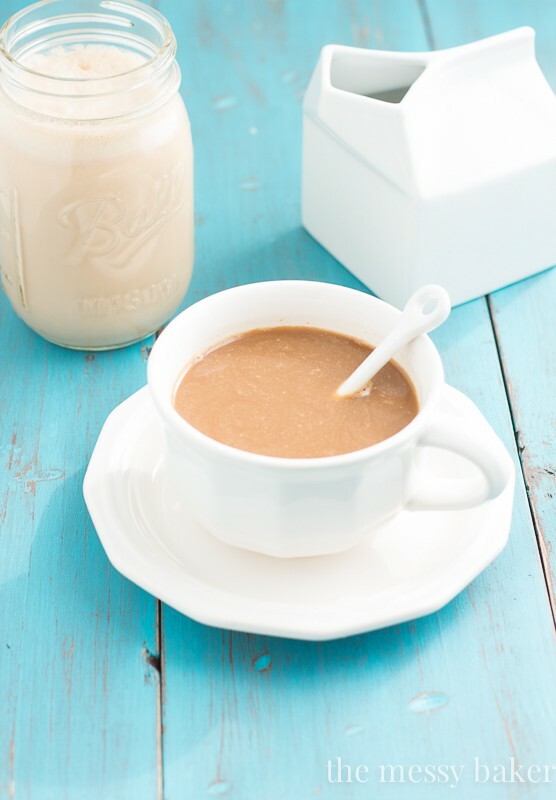 It never occurred to me to make my own creamer but it sounds super easy and delicious! AND you can pronounce all the ingredients! I’m so glad you did! I recently broke up with Non-Dairy Creamer (have you seen what’s in there?!) and have being using Half & Half and it’s just not the same! This is so smart! What a great idea and you’ve made it so easy! Also that little white spoon is soo cute! Thanks, Chelsea. The spoon is from Crate & Barrel, and I believe I only paid $.95 for it. Deal! Must make this! Caramel macchiatos are my go-to drink in the winter, and I love caramel flavored creamers, but all those crazy ingredients push me away. This is perfect. Yes, they’re mine, too! I can’t wait to swirl it in my iced coffee when the weather warms up. Brilliant! Not only does this look mega delicious, but I love that you can make it with far less preservatives/more naturally than the store-bought kind. Love it! Thanks, Amy! It tastes so much better than its store-bought counterpart. Omg coffee creamer is that easy to make? I don’t know why I never wondered what goes into the stuff. Yours sounds delicious, Jennie! Amazingly enough, I have every single one of these ingredients at home right now. I see a lot of caramel macchiato creamer in my life soon (I may or may not drink it alone. Don’t judge). Girl, we are soul mates, I tell ya! I used to do the same thing. I would also steal all of the creamers at the table whenever we would go out to a restaurant for breakfast. Mmmm! No judging here; I took a little sip of it on its own. It really bumps up the flavor of your morning coffee. Thanks for pinning! This sounds so amazing! I’ve always been a little put-off by store-bought “creamers”, because of all the weird ingredients most of them contain (I read somewhere that in Canada and the UK, they call coffee creamer “whitener”, which I think is more accurate judging my some of the ingredients in there), which is why making it from scratch is absolutely BRILLIANT. I am so adding caramel to my coffee tomorrow morning. Done! Eww, whitener sounds so unappealing. Homemade is where it’s at. Great idea! So nice to know what’s in it instead if store bought coffee creamer too. What?! Caramel creamer is that easy? This must happen. My coffee will love me! My husband is going to be so pumped about this!!! He gets so mad when he gets hooked on a certain flavor of creamer, peppermint mocha/toffee/heath bar, and then they stop selling it in the store. This is so clutch! It’s entirely possible that I would sneak some of that plain… No shame. Also, how adorable is that ceramic milk carton! Gah. this is just reason #938: why jennie needs to live next door to me. I’m definitely going to make this! Honestly, I’ve never had a caramel macchiato, but if this is the creamer – I want one! Thanks for bringing the coffee shop into the kitchen! “Dairy free” coffee creamers are EXPENSIVE as well as not very healthy! In lactose intolerant so I couldn’t just switch to half&half. Instead I would combine coconut cream and coconut milk (from cans) and add some dulce de leche ( buy a can of sweet and condensed milk and boil it in water for about 2hrs..). Add some almond extract and vanilla (either beans of extract) and you have a delicious creamy coffee creamer! I also usually put a table spoon of coconut oil in my coffee anyway. Making this creamer just makes it taste sooo much better!